When I saw these little friends I just couldnt pass them up. Just looking at them makes me smile. Made by a wonderful artist IDotJapan . 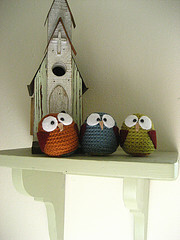 Now they brighten up our living room with their big owly eyes. I’m so glad you like them. I’m liking your new blog too. hoooooooooot! that is cool mom. This is maya ! The owls are so cool ! I am glad that you have those cute owls!